After having lived in a swimming pool for one night (you did read yesterday's article, didn't you), it was time to clean the house, er, well. I drained the water from the well for about two hours, dumping roughly 200 gallons (although we are on a well, we do have a water meter, because we have to have one, as I explained to you a while back, and therefore I know exactly how much water runs through our system). There is still some chlorine noticeable in the water, but it is more subtle and should disappear within a few days. The wait station is moving along, even if it may feel slow to you. E! was cleaning the floor yesterday and today to remove the gum of decades. Tomorrow the floor should have dried out enough to reseal it. E! 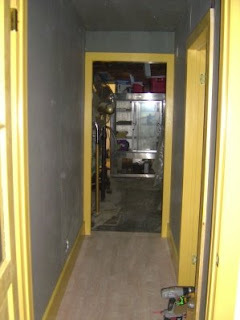 had also been busy painting the trim for the bathroom hallway, so today I installed it. 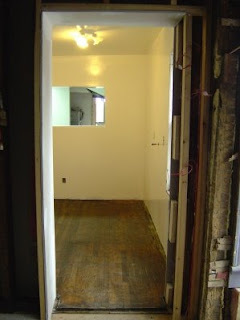 Hopefully we'll receive the color pigment in the mail tomorrow so that I can start plastering. It was a rainy day, again, and after having installed the trim and baseboard in the bathroom hallway, I didn't feel like (physical) work anymore, so I did some book-keeping, which I am completely behind on (remember, we don't do this for fun - alone - this is a business, and there are people watching over what we spend our money on, like, say , the tax man - or woman).